On the east coast of Florida lies a thin, 20 mile long stretch of beach. It looks a great deal like the many other beaches in Florida, but one important difference is immediately clear. It is some of the least developed beachfront real estate in the United States, which is particularly jarring considering that it is close to the city of Melbourne and right off of the major A-1-A highway. Why isn’t this beautiful and accessible stretch of beach covered in hotels and luxury apartments? An enormous number of signs listing the things you can’t do on this beach also grabs your attention. No ATV’s, horses, dogs, or beach chairs are allowed. Feeding wildlife, including seagulls, is strictly prohibited. Under no circumstances can you build a campfire- not that you’d need to, since the public isn’t allowed on the beach at all after dark. This remarkable stretch of beach is the Archie Carr national wildlife refuge. Though it takes up less than 250 acres, it provides critical habitat to some charismatic and endangered marine life. 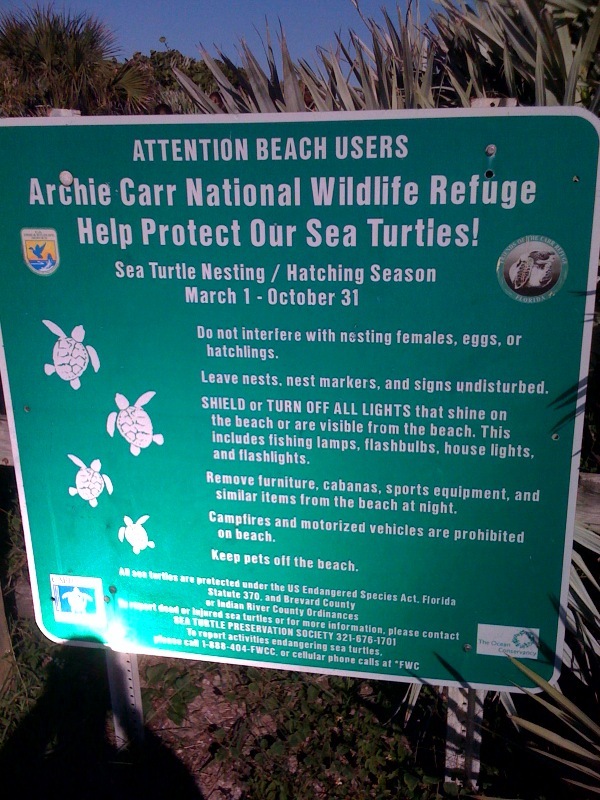 The beach here is some of the most important nesting habitat for green and loggerhead sea turtles on Earth.25-35% of all green and loggerhead nests in the United States are within this 20 mile stretch of narrow beach. No other beach in the U.S. has more green sea turtle nests, and no other beach in the Western hemisphere has more loggerhead nests.The occasional leatherback also nests here. What makes so many turtles lay their eggs in this small area? The answer has little to do with the beach itself. While the landscape at Archie Carr is just what an egg-laying sea turtle is looking for, the same is true of many other beaches which get drastically fewer chelonian visitors. What makes this beach so inviting for sea turtles is what isn’t there. Now that the problem of shrimp trawler bycatch has been solved by the turtle excluder device, the main threats facing sea turtles come from humans disturbing their nesting beaches- disturbances which are absent from Archie Carr NWR. Lights from beachfront hotels disorient hatchlings trying to get to the ocean following the light of the moon. 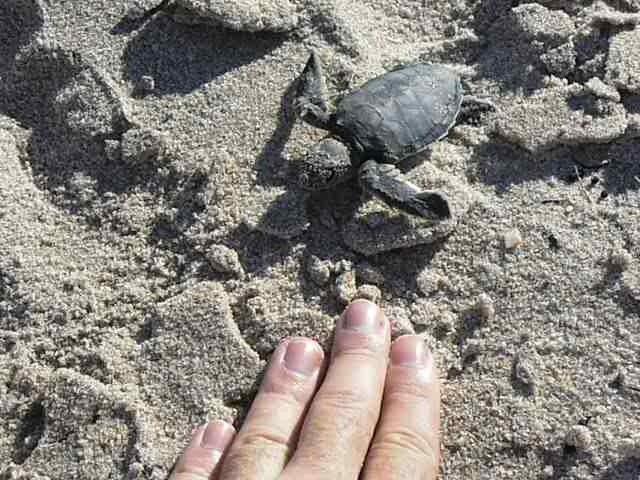 Beach chairs are insurmountable obstacles for a hatchling small enough to fit in the palm of someone’s hand. 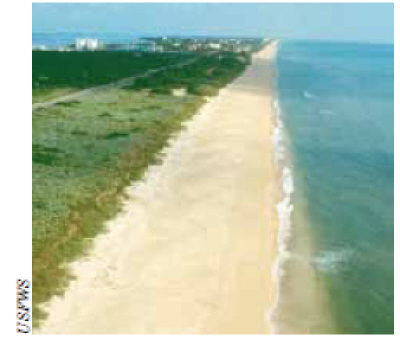 Beach renourishment and armoring alters the natural landscape. Pets dig up and eat eggs. ATVs can crush entire nests. With this in mind, all those pesky rules concerning what you can’t do in Archie Carr National Wildlife Refuge make a lot more sense. Without the existential threats that have become commonplace on beaches throughout the world, sea turtles here are thriving. 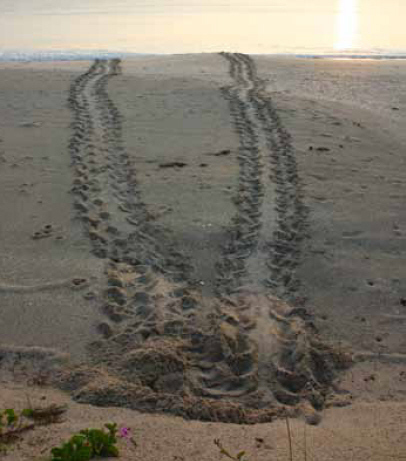 After decades of population declines, TED laws and Archie Carr beach protections (which occurred at approximately the same time in the early 90’s) have resulted in increasing numbers of green and leatherback nests for several consecutive years. A few other beaches throughout the world are considering the adoption of similar rules. As long as fishermen use TEDs, nesting beaches get critical protections, and global warming doesn’t result in entire populations of female turtles, these charismatic species should continue to awkwardly haul themselves along our world’s beaches for many years to come.